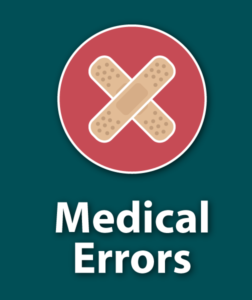 Medical errors and falls are two major concerns for patient safety in the healthcare community. From the patient’s perspective, they are required to take a ‘leap of faith’ while receiving the care they need. Why? For the patient room to be the haven that the patient expects, they must rely on the stewards of their care to enact policy that governs their safety outside of their control. Human factor plays a large roll in errors that impact patient safety. So while the patients place their trust in their doctors and nurses, they are at the same time putting their trust in humans that are busy and have an immense demand on their time. Distractions and a full schedule make errors more likely to happen and should be top of mind for healthcare leaders while looking at technology as a tool to improve patient safety. For example, Medical abbreviations, including acronyms and symbols, are a liability and not a tool to help save time. The report from the ECRI Institute, SUPPLEMENT A September 2009 says that “[m]ost medical abbreviations, acronyms, and symbols originated before healthcare providers and organizations realized that certain abbreviations, although time-saving, can be misinterpreted and can cause errors that lead to adverse outcomes or death. For example, when “U” is used as an abbreviation for units, it can be mistaken for a zero. An incident occurred in which a patient died when “20U” of insulin was interpreted as “200 U” (U.S.FDA). Another problematic abbreviation is “μg” (for micrograms). It can be mistaken for “mg” (i.e., milligrams), causing a 1,000-fold error (Joint Commission “Medication”). These dangerous abbreviations, acronyms, and symbols are regulated. However, these regulations are only governing medication orders. Other elements of the health record and different mediums that are appropriate for the nurse, physician or the aid to refer to a medical term or dosage in short-hand are not regulated and continue to plague our hospitals. The Joint Commission is maintaining a “do not use” list. As an example of what is included in the list are the less-than (<) and greater-than (>) symbol because they can be mistaken for an “L” or a “7”. Although not regulated, the ECRI report goes on to say that the Joint Commision would like these abbreviations to be avoided on “all clinical documentation—including all types of orders, progress notes, consultation reports, and operative reports—and is consistent throughout the organization.” These principles and concepts apply to all record keeping in the patient room as well. The impact on patient safety these boards have is greater than one may think. The study indicates that staff look at and use the information that is written on the dry-erase boards in the patient room. The potential for error is great in this medium due to handwriting inconsistencies, use of acronyms and lack of time to fill out the information required. When the careteam information is not up-to-date, it increases the amount of time it takes to find a nurse when there is an emergency. Mistaken dosages and notes due to poor handwriting can have deadly effects on the patient if the patient room whiteboard is used as a reliable source of patient information. By implementing technology enhancements with electronic patient room whiteboards, patient safety elements blend into patient communication initiatives. By documenting in the health record and automatically flowing that information to the electronic whiteboard in the patient room with reliable accuracy, it maintains consistency throughout the communication continuum. 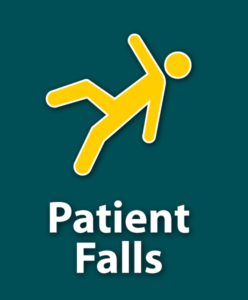 Reduction in patient-falls is impacted by improved communication. Naturally, technology is an indispensable tool for fall-reduction. For example, smart beds are a must-have for hospitals that want to improve their falls. Smart beds have sensors in virtually every part of the bed, and that information is put to work to inform staff of a condition that could cause a fall or could make the results of a fall worse. For example, when a patient is a high fall risk, the bed rails, bed height, bed brake, and bed alarm all play a critical role in the patient’s care. If one of those safety elements are out of compliance, it could result in a patient fall or a patient fall with an injury. If the staff was alerted in advance of any unsafe bed conditions, falls can be prevented. Live information from the EHR and alerts from the bed can flow directly to technology such as the patient room electronic whiteboards, door displays, nurse station whiteboards, WOWs and mobile devices providing invaluable insight to staff before any sentinel events happen. In these examples alone, technology plays a pivotal role in the modern healthcare setting, bridging the gap in the coordination of care and communication. 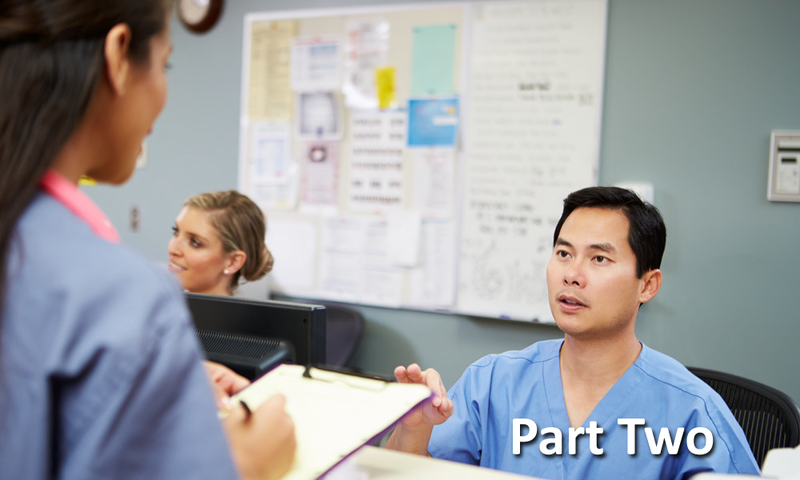 In part three of this series, we will discuss the patient experience and how technology plays a role in reinforcing patient experience initiatives. If you missed part one of this series, click here to be redirected to that article. 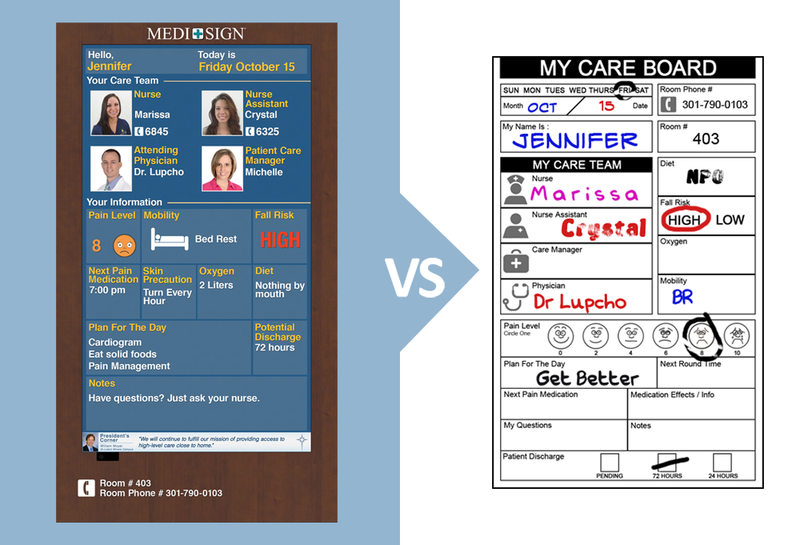 To learn more about MEDI+SIGN Digital Patient Room Whiteboards and how they prove to be ideal for patient room communications to improve patient safety, please visit us at: www.medisigndisplays.com.